wonderful and so festive! your basket weaving isterrific. i love to finish cakes this way. this post puts me in a memorial day mood!!! Ellen, I LOVE your tablescape. It is such a nice tribute to our men and women in the military! !as well as the veterans. Red and blue are my colors! You have such amazing good luck at Good Will. The cake is lovely . You are becoming quite talented as a cake decorator! Wow! What a gorgeous table and that cake….all I can say is: AMAZING. And I bet it tastes as good. Glad you are feeling better from your surgery. No matter what it is, it still takes a lot out of you. This came out great and the basket weave looks really nice!!! You are getting to be a pro! Only problem is now I want cake with strawberries on it and some of that yummy lemonade too! I must have missed something! Ellen, I am so sorry to hear that you had to have surgery!! Hope you are feeling much better now. Your tablescape is BRILLIANT! Love all of the patriotic touches!! It could also be used for Fourth of July!! Great Job! I, too, love lemonade!! I have never been to the Goodwill store…will have to check it out!! By the way, Ellen, when did you stop RVing full time? Just wondering…we are getting ready to head out on our road trip!! You JUST learned the basketweave??!?!?!!! I’d say you did an EXCELLENT job of it!!! Wow! I gave up trying a LONG time ago!!! Wonderful tribute to those who have paid the ultimate price in defense of this country. I didn’t know you were having surgery. I hope you are feeling much better very soon. Have a safe and fun Memorial Day weekend! What a beautiful table. Love all of the red, white and blue. Your cake looks amazing! 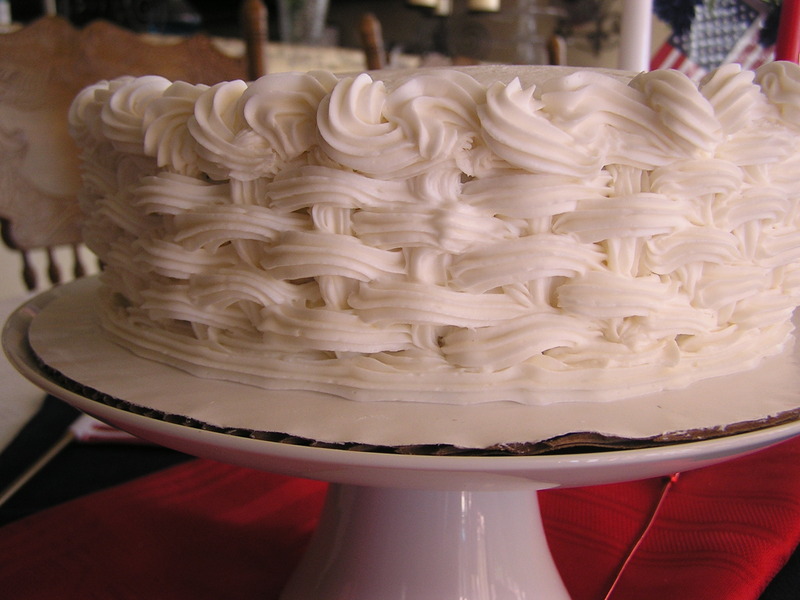 I tried cake decorating once upon a time…it was a failure of epic proportions. You are very talented! Thanks for sharing your festive table. Have a great weekend! Your cake is beautiful! It is hard to believe that is the first time you tried that design. It will look wonderful with strawberries on top. Your table is a beautiful tribute. 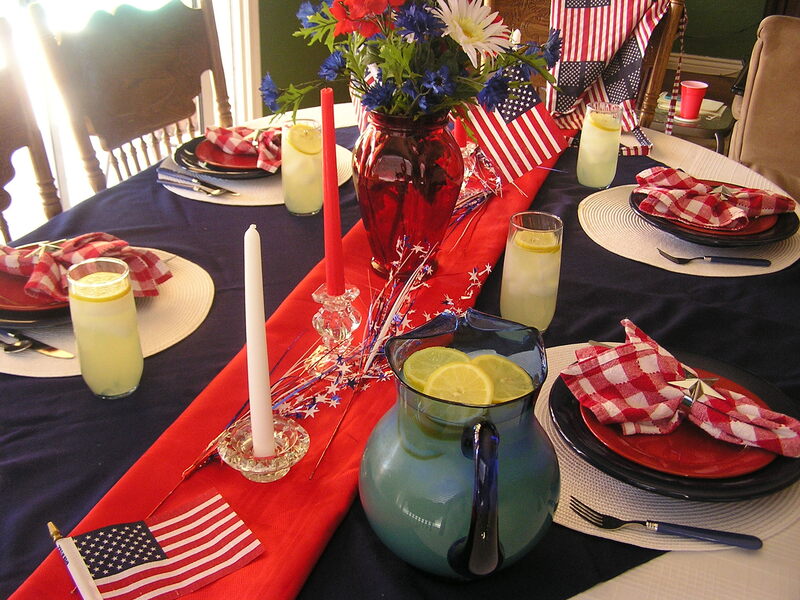 For someone who didn’t have much red, white and blue, you sure put together a beautiful table. Have a wonderful holiday weekend. I hope you are healing quickly. 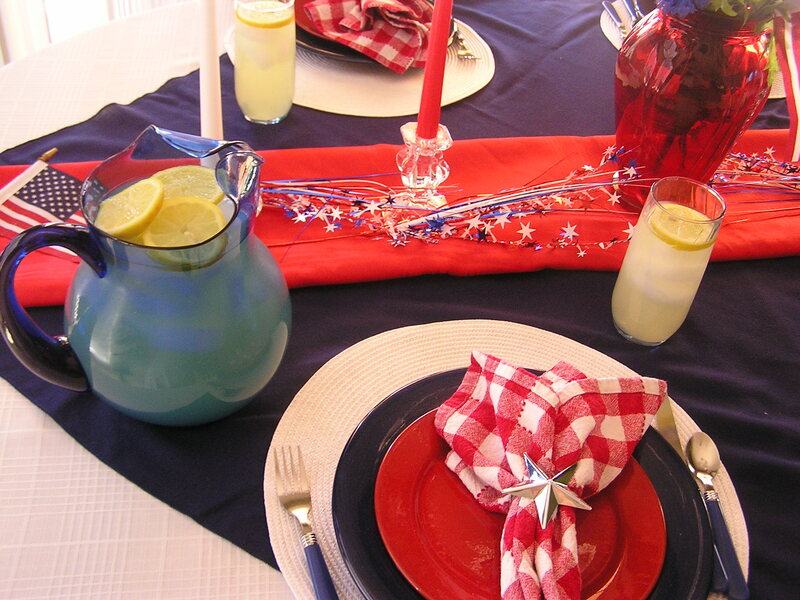 For not having much in red, white, and blue, I’d say you put an amazing table together! 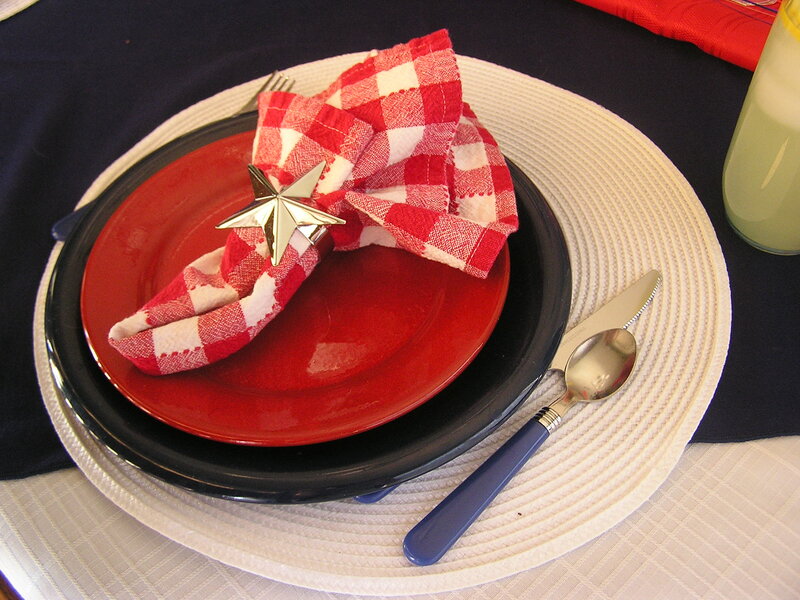 Great idea for creating a runner, and your napkins and star napkin rings are really cute! Beautiful cake, too. I am totally addicted to Goodwill, and have to force myself to wait until senior discount day! Hi Ellen! I hope you’re feeling better from your surgery. 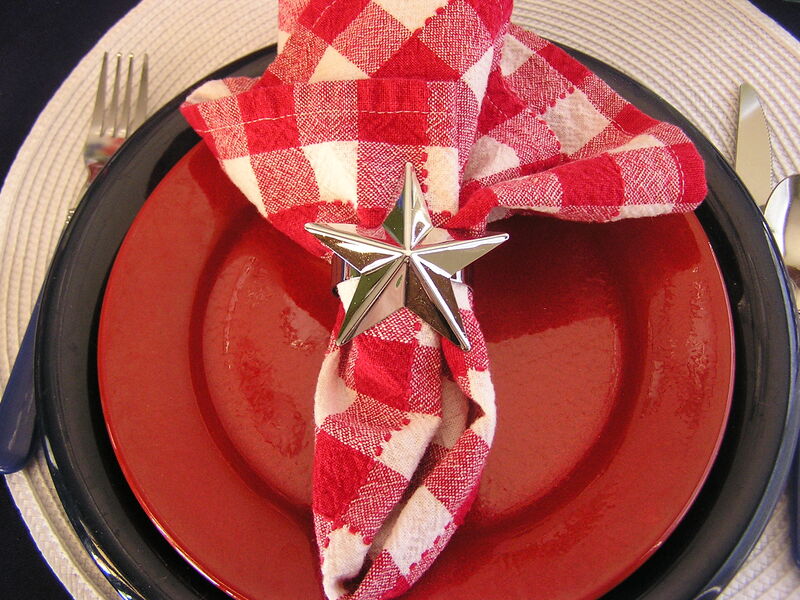 Your table is so festive and you’ve decorated it just wonderfully. I love your cake! It’s gorgeous and I think the strawberries will look so pretty on top. You’re really doing well with your cake decorating. Thanks for popping in to see me. 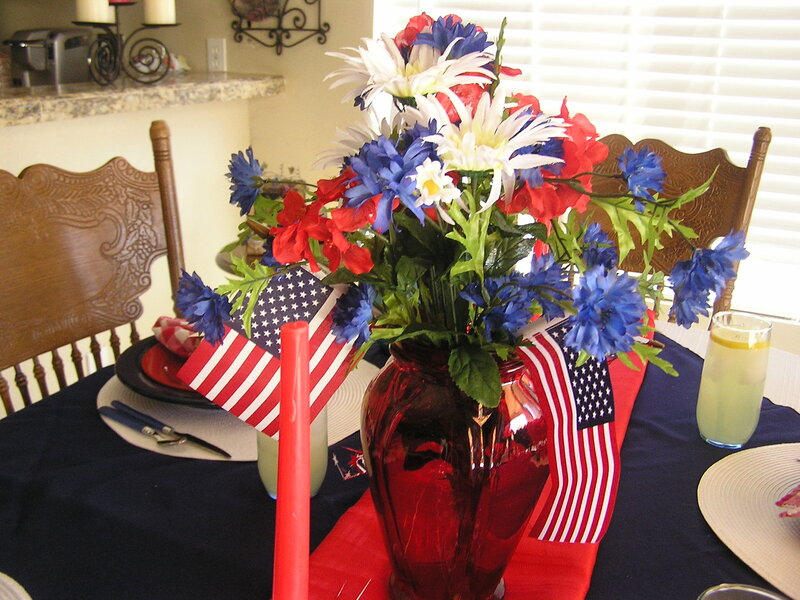 Love your patriotic table, Ellen! 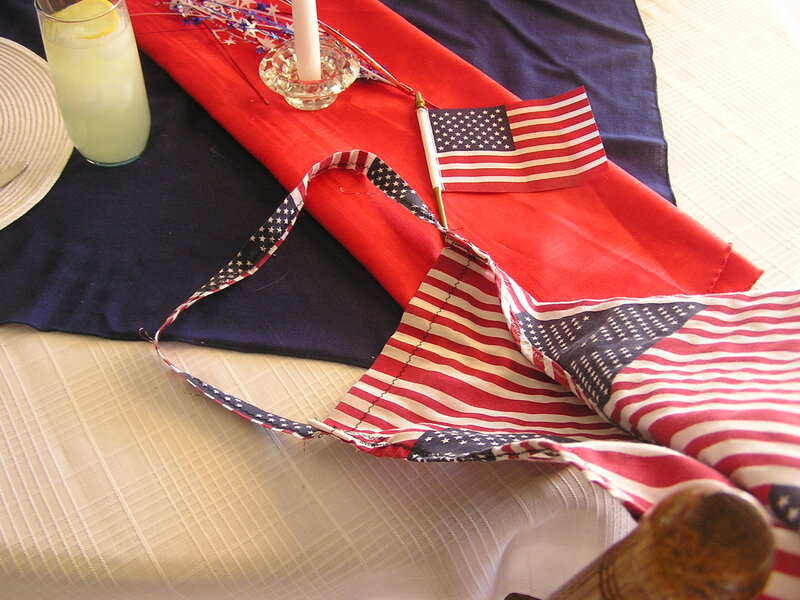 You will get lots of use from your red white and blue. 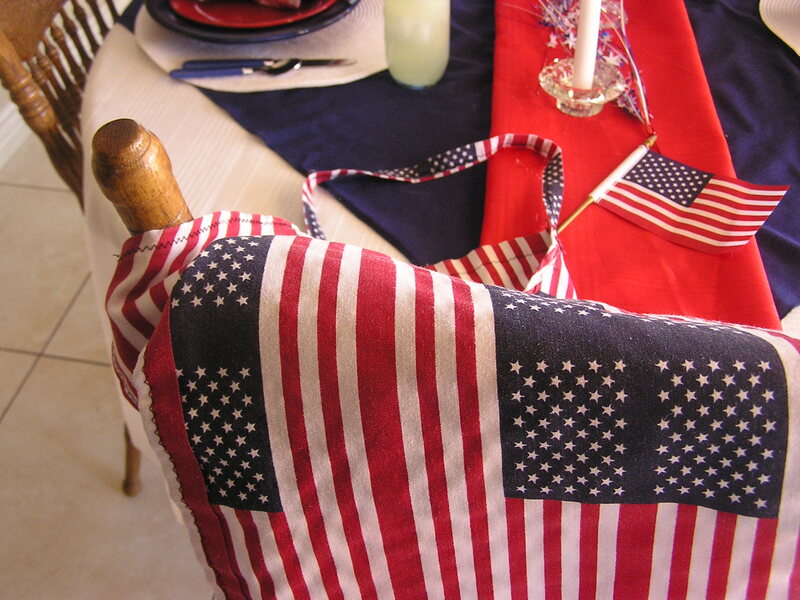 Flag day, July 4th Memorial Day! Your cake looks wonderful! Great job! God bless our service people. There’s no way to go wrong with red, white, and blue. 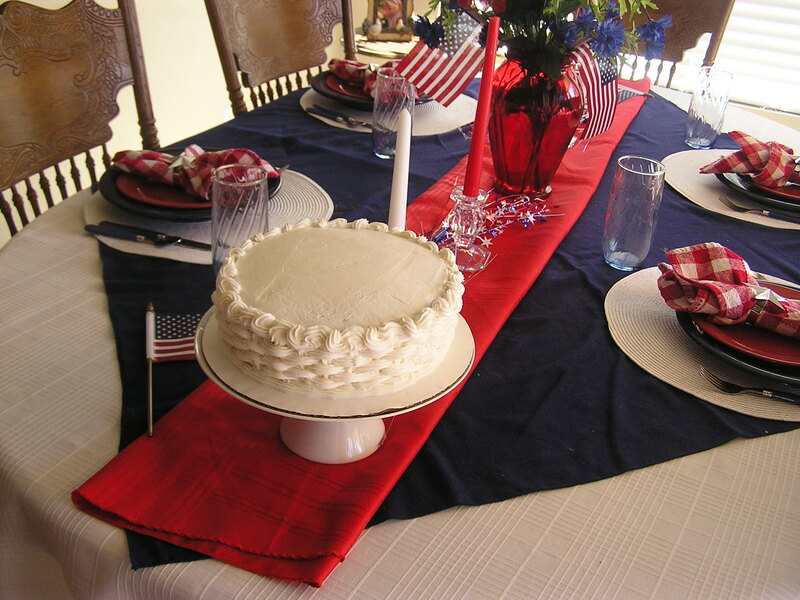 Love your table and your cake looks wonderful! Thanks for dropping by and congratulations on the twin girls! How exciting that must be! 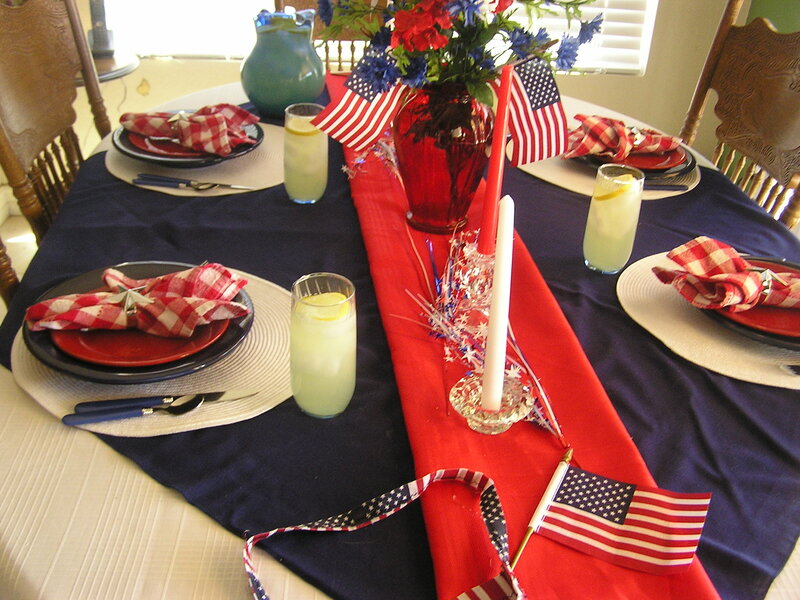 I love your festive red, white and blue table! Cute napkin rings. Your cake looks fabulous! 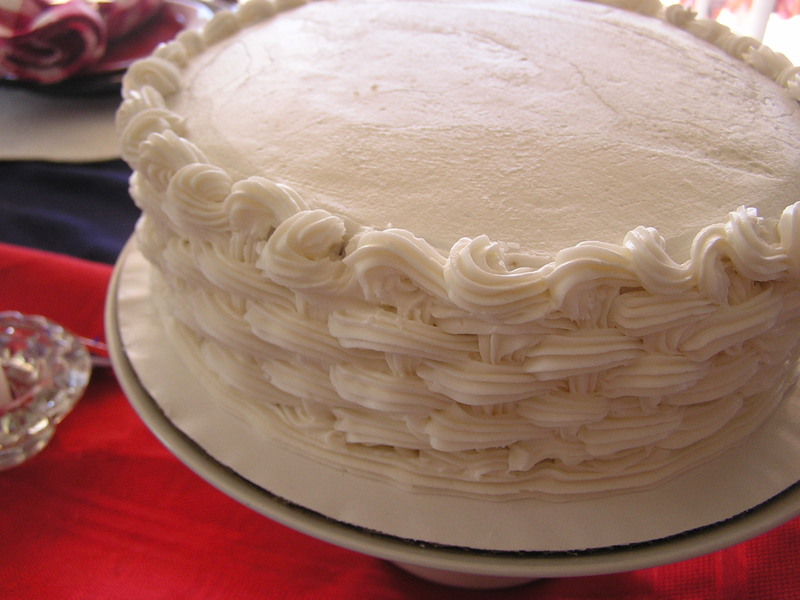 I’m picturing it with strawberries on top – perfection! Such great patriotic table! Love that cake, yummy!!! 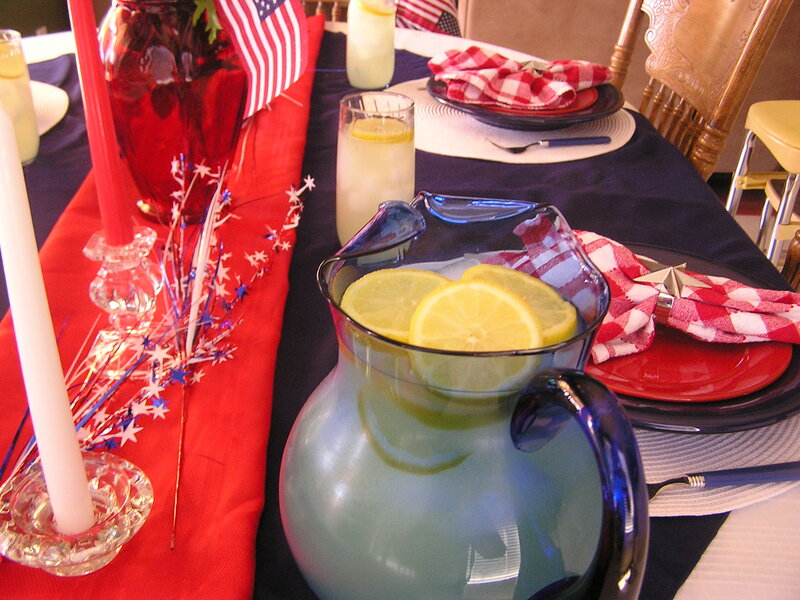 Your table for Memorial Day is perfect, fresh and so inviting, wish I was there to enjoy it! Many blessings for the families of the heroes. Thank you for your lovely and generous visit and good wishes for our Sil Enjoy the weekend. As always you come up with a great looking tablescape. Have an enjoyable holiday weekend. Wow! 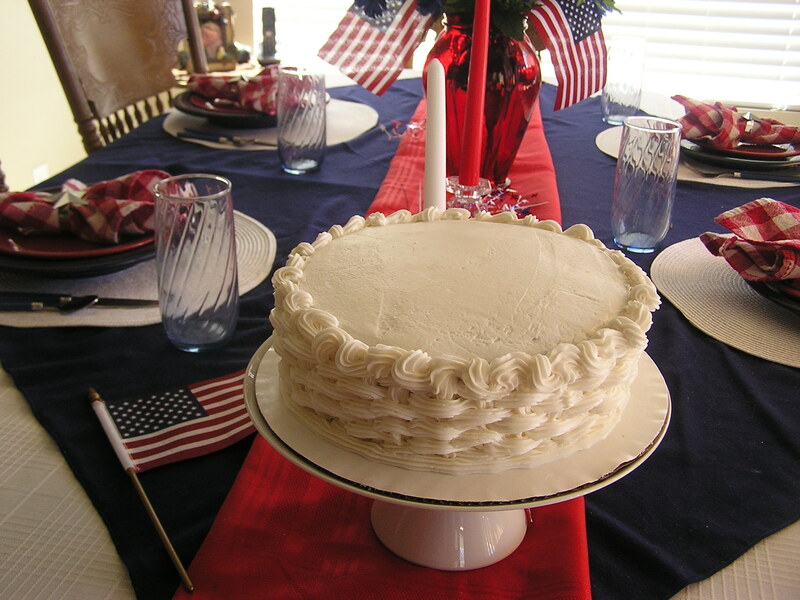 What a gorgeous Tablescape for Memorial Day.. and that cake with the basket weave is Beautiful….just: AMAZING. And I bet it tastes as good.I didn’t know you were having surgery. I hope you are feeling much better very soon. Thanks so much for your sweet comments on my Tablescape. I hope you and your family Have a safe and fun Memorial Day weekend! Great job, I would also say I think your cake decorating class is going pretty good. I took one several years back and now you have gotten me thinking about it. 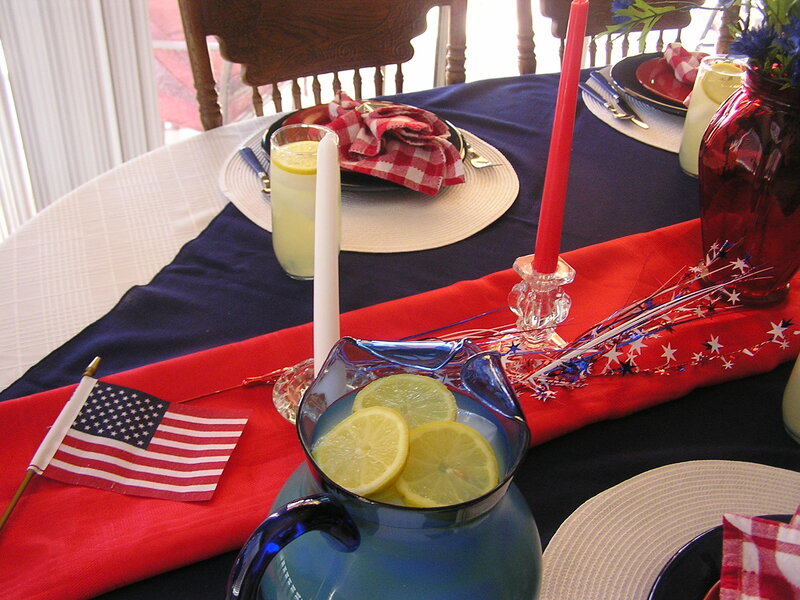 Your tablescape is perfect for Memorial Day. How festive and fun Ellen! LOVE your table. I think patriotic red white and blues are so much fun to do. I have one coming up later! I think your cake looks awesome!!! I would love to learn how to do that. You always seem to find the BEST STUFF at Goodwill…..how do you get so lucky? The only thing I’ve bought at Goodwill is some Levi capri’s for $3….but, I admit, they were a FIND…..I wear the heck out of them!! !